After bringing Becky and Billy home last February, we are still having firsts. This holiday season has hosted a bunch more: the first tick or treating, the first pumpkin carving, and the first costumes. Next will be more through Thanksgiving and Christmas… all firsts for Becky and Billy and for us with them too. They loved pretending in costumes they wore 3x…. once to a school party, once to the dress up day at school, and once on halloween. Jake chose to be a cop, TJ wore grandpa scott’s cowboy hat and some gear, Billy was superman, Tyler a ketchup bottle, and Becky chose a fairy. Having grown up in a fairly primitive and dust filled space, you’d think Becky would be ok with dirt and slime and stuff… but she hates yucky stuff. Grabbing pumpkin guts with her bare hands were met with nasty faces and repeated claims that this is “yucky”. The youngest kids drew on the faces and I carved them when they were done. Our neighborhood serves for great trick-or-treating with lots of common streets, kids all over the place, and plenty of houses to choose from. Since we no longer have to be at church, we have friends over for dinner, meet the neighborhood in the street with java in hand, and then go hiking for candy. 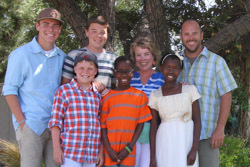 The Hammond’s- who went to Africa with us to adopt too- joined us and off we went. We ended up meeting up with 3 other families from our street and spent the next 2 hours going house to house mob style with 14 kids, 10 adults, and the dog. When we get home, the Berrytribe plan involves dumping the entire loot into one pile… no fighting over whose candy is whose or we take it all away. We just sort it and let them pick a piece from the loot now and then. In about another week, we’ll “miraculously” get rid of the rest of it: there’s always more than our family could ever reasonably consume. Our kids are onto us and think we should send a bunch of it to Welcome Home in Uganda… but cost and the “melting” factor may keep that from happening. Maybe we’ll take it to Mexico with us in another 10 days and share it with the daycare center we’re gonna visit. my family is finishing up our fourth and fifth BAGS of candy… we always eat it all ourselves because we dont get any trick-or-treaters on our street.